Geoquip Marine is a specialist offshore geotechnics service provider, primarily focusing on heave compensated drilling, sampling and in-situ testing. Geoquip Marine’s in-house designed drill rigs operate in water depths from 10m to 3,500m. Besides downhole sampling and testing, Geoquip also provide a number of seabed in situ testing tools, including our 200kN (20 tonne) seabed Cone Penetration Testing (CPT) systems capable of acquiring continuous data up to 50m below seabed. As a global provider of offshore geotechnical services, we currently operate six drilling vessels servicing the offshore industry. Each of the permanently mobilised geotechnical spreads include downhole piston and push samplers, hammer samplers, downhole core barrels and wireline PCPT tools. All our offshore spreads are equipped with a soils laboratory, catering for any type of geotechnical investigation, be it for an oil and gas platform, wind turbine generator, suction anchor or any other form of offshore foundation. We also operate downhole seismic PCPT, PS-logging and pressure meter equipment. 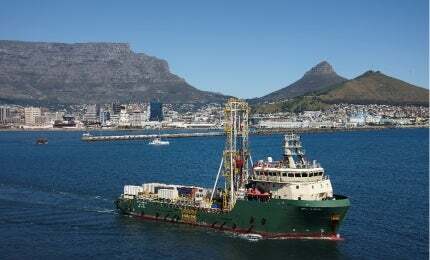 Geoquip Marine provides specialist services for deep water gas hydrate and mineral exploration surveys. These investigations focus on obtaining natural gas hydrates and mineral samples in deep water marine environments to provide information on these unchartered reserves. Specialist Pressure Corers are used to sample and retrieve the natural gas hydrate in its in situ (frozen under high pressure) state. Our Deepwater Cuttings Collection system is a first in the offshore industry and allows for large quantities of minerals to be collected efficiently and economically. In addition, we also provide Logging While Drilling (LWD) services. Our deep water drilling rigs and DP2 vessels provide the ideal platform for a range of deep water investigative services. Geoquip Marine has an experienced in-house engineering team capable of undertaking a range of engineering services including but not limited to, in-place and installation performance of piled foundations, spudcan penetration assessment and mudmat capacity analysis. We take pride in enhancing our site investigation services with offshore real time engineering. This allows our Clients, with our experienced geotechnical engineers, to adapt the geotechnical program to the encountered site conditions, therefore ensuring we meet or exceed the objectives of the investigation. Geoquip Marine is accredited to ISO9001:2008 for Quality Management Systems, ISO14001:2009 for Environmental Management and BS OHSAS18001:2007 for Occupational Health and Safety. In addition, all our vessels have implemented the ISM code. Geoquip is proud to confirm that our HSE performance is world class – we have a demonstrable history of incident reduction whilst enjoying and learning from year on year observation/near-miss reporting increases. We are committed to Continual Improvement in everything we do – our aim is to execute every project on time in full and incident free. We never stray from this objective. If you require any further information, or would like an update on the whereabouts of one of our six drill ships, do not hesitate to contact our sales team in St. Gallen or our project management team in Bath by phone, Email or web enquiry.